Aside from the website being a tool for Internet marketing, your website acts as your practice brochure and an extension of any other marketing you do. It is often the first thing people look at when considering going to your practice. Postcards, coupons, ads, referral marketing, etc., are made a lot more effective when the person goes for more information to a website that is a successful marketing vehicle. 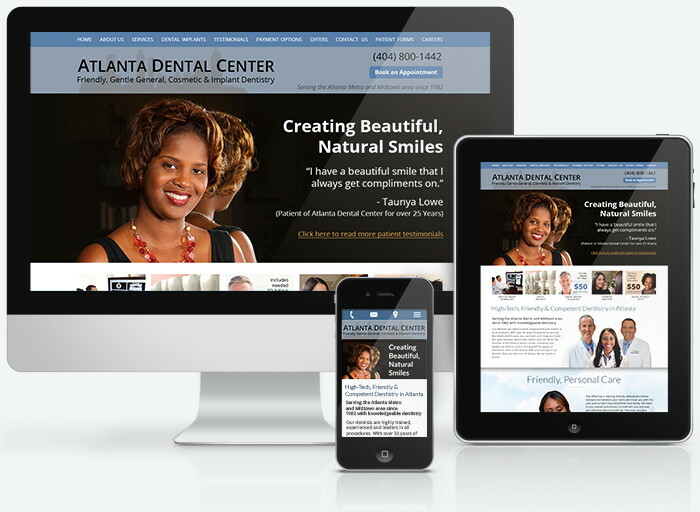 We create websites for dentists that have all the necessary ingredients to successfully market their practices. Each website is custom-made for your practice and your area to market your different services, such as general, cosmetic, restorative, implant dentistry or specific procedures, such as Invisalign®, CEREC, sleep apnea treatment, etc. Your website represents your practice. These are not “customized” sites based on a template or using canned copy. More than just patient education, every page of a Gilleard Dental Marketing website will market you and your practice to “pre-sell” the website viewer to want to be your patient. Our goal is for your website to be a true reflection of the benefits of going to your practice. Visitors should feel that they have a good introduction to your practice, enough that they can feel certain they will receive friendly, knowledgeable, accurate and comfortable care. Our websites are offered as a standalone design service or as part of our Internet Marketing Program, in which we use the Internet to drive visitors to your website. call 855‑486‑2410 or click here to schedule online. “…because I had the impression that it would do nothing other than give often inaccurate information, not be able to communicate the correct message that I want to send and perhaps deter a patient from coming who might otherwise come by some other means. I was also afraid of wasting money on something that looked nice to me but was totally ineffective at getting patients to come to the office. “Boy was that a mistake!! “The website created by Gilleard Dental Marketing is spectacular. The site is very professionally laid out, it is informative without being overwhelming and it is easy to navigate. Patients rave about the site. Your custom design is based on market research, your area, your focus and your preferences. We use aesthetics and appropriate imagery to attract and engage the reader. Each website is made using the latest protocols in web creation, including the necessary code for your website to be easily found on the Internet. All our websites are responsive, meaning they will size to the device they are being used on, whether it be a laptop, mobile phone, tablet or other. 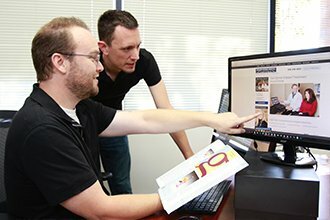 Our Deputy Creative Director reviewing the design of a website with our website coder. Schedule your Complimentary Marketing Consultation Today!